Ever since the opening of Walt Disney World in 1971, the city of Orlando has bloomed into a centre of excitement, relaxation and the place where dreams come true. With an ever burgeoning variety of resorts, activities and attractions, Orlando appeals to a wider range of tourists and many people will visit the area at least once, if not annually. With hundreds of lakes and wetland areas, Orlando takes full advantage of its incredible weather for outdoor activities and the flagship theme parks of the world for a vacation of fun and flair. Unlike many American cities, Orlando’s attractions lie outside of the city limits so rent a car at the start of the vacation in order to make the most of this thrilling location. 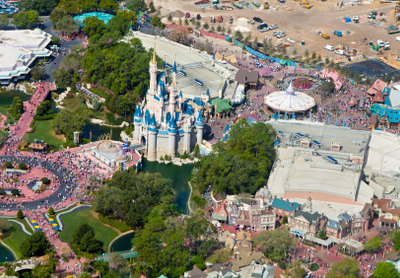 A hire car allows unrestricted access to the main attractions like Walt Disney World and Universal Studios. Soak up the sunshine at one of the many waterparks, such as Seaworld, Wet ‘n’ Wild or Discovery Cove, both of which features interactive experiences with wildlife and warm tropical waters. Orlando even manages to turn driving into an adventure, with the Exotic Driving Experience, where you can exchange your hire car for a supercar for the day on a private track. Orlando International Airport is closer to the city centre than the resorts and for many tourists renting a car enables a freedom of choice beyond the public transport system around Orlando. The city has 170 challenging golf courses to choose from, scattered around the wetlands and best accessible by car. Orlando also has some enticing neighbouring cities and an extensive network of freeways to allow for day trips in the car. Driving to Tampa takes just an hour and a half whilst the glittering lights of Miami can be reached in three hours for a taste of the big city. Alternatively, Orlando is closely connected with many areas of natural beauty. Daytona Beach can be reached by car within the hour and the nearby Highway 95 boasts ten national parks and endless sands for relaxation and rejuvenation.